The plate was full size (larger than shown here), and made a perfect display in a case or on a wall, or indeed on a mantle-piece! The plate was hand-crafted in The Potteries at Stoke-on-Trent, by William Bates & Co.
As you can see in the image shown here (picture shows some reflected light), a lot of thought went into the design, which was in the style of a clock face, with Bill Nicholson and the League Championship and FA Cup trophies in the centre, surrounded by the 12 most prominent members of the squad that lifted those trophies. Those players have been shown in the position relative to their number - Brown, Baker, Henry, Blanchflower, Norman, Mackay, Jones, White, Smith, Allen, Dyson, and Terry Medwin, who has been chosen as "Number 12", as he was the most regular player other than the first eleven. 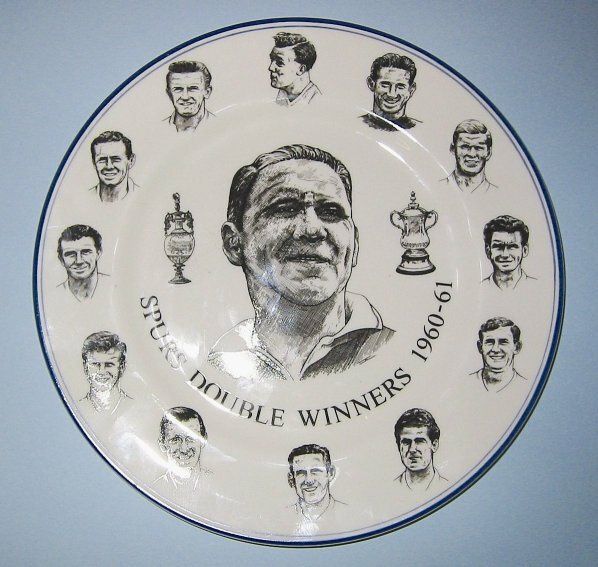 Spurs Odyssey was not on any commission, although I was very glad to receive a plate which was proudly displayed above my staircase, with the classic Mackay v Bremner photograph.